1 Heat up a wok until hot. Put all the ingredients for the sauce in a small bowl mix and set aside. 2 When the wok is hot pour in the groundnut oil, move the oil around the wok then add the tofu and stir. 3 Keep the tofu moving and after 30 seconds add the ginger and garlic, keep stirring to insure you don’t burn the garlic and ginger. 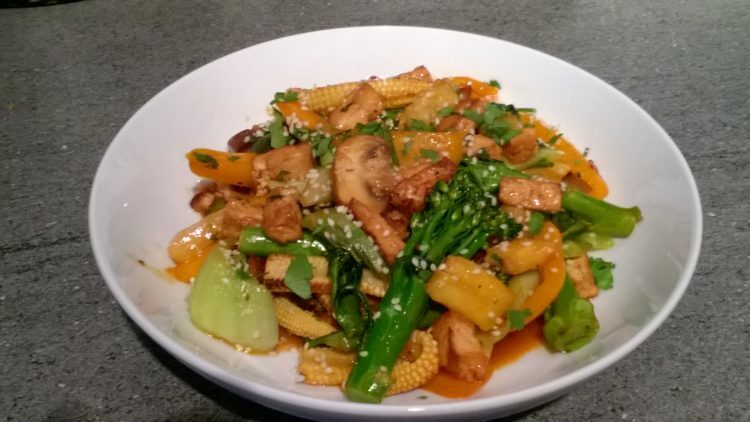 4 After 30 seconds add the baby sweet corn, tenderstem broccoli, orange pepper and mushrooms stir continuously and cook for about a minute. 5 Add the pak choi and fresh pineapple stir and cook for another 30 seconds, then add the sauce and stir. 6 Add the spring onion stir making sure the sauce has combined with all the ingredients and cook for 1 minute. 7 Keeping two pinches of the chopped coriander for garnish, add the chopped coriander and stir. 8 Plate up and sprinkle the chopped coriander and sesame seeds, serve and enjoy.